Nanded is a city in Maharashtra state, India. It is the eighth largest urban agglomeration of the state and the seventy-ninth most populous city in India. It is the second largest city in Marathwada subdivision. Nanded is the centre of governance of Nanded district. Nanded is a major destination for Sikh pilgrims, because the 10th Sikh Guru (Guru Gobind Singh) made Nanded his permanent abode and passed his guruship to the Guru Granth Sahib before his death in 1708. Nanded is located on the banks of Godavari river in central west India. It is closer (approximately 275 kilometres (171 mi)) to Hyderabad in the state of Telangana than it is to the capital of Maharashtra state, Mumbai. Nanded district borders Latur district and Parbhani district to the west and Yavatmal district to the north. The district is bounded by the Nizamabad, Medak and Adilabad districts of Telangana state to the east. Nanded has two parts: Old Nanded 20.62 square kilometres (7.96 sq mi) occupies the north bank of the Godavari river; New Nanded, to the south of the river, 31.14 square kilometres (12.02 sq mi) encompasses Waghala and six other villages. From a copper plate inscription found at Washim, a town approximately 150 kilometres (93 mi) north of Nanded, archaeologists deduce the city was formerly known as Nanditaṭa (Marathi: नंदितट). Another name was Nandigrāma. Folklore suggests that the name "Nanded" developed from Nandi the Vahana of Shiva. Shiva was said to have performed penance on the banks (Taṭa) of the Godavari river. This "Nandi-taṭa" later became "Nanded". Nanded is an old and historic centre. Local irrigation practices and Nanded itself are recorded in the treatise, Leela Charitra (late 1200s CE). In the 5th and 4th centuries BCE, Nanded was ruled by the Nanda dynasty. In the 3rd century BCE (about 272 to 231 BCE), it was part of the Maurya Empire under Ashoka. In the 1st century CE, power in the area lay with the Andhrabhrtyas and Satvahanas. From 1636, Nanded was the centre of governance of Nizam State now Telangana, Karnataka, an imperial province of the Mughal Badshah (emperor) Shah Jahan. In 1657, Nanded merged into Bidah Subah. In 1725, Nanded became part of Hyderabad State. It continued to be part of the Nizam of Hyderabad's dominions until 1948. After India gained independence in 1947, the Indian Armed Forces annexed Hyderabad and ended the rule of the Nizam in Operation Polo, making Nanded part of the new Hyderabad State. Nanded remained part of the annexed Hyderabad state until 1956 when it was included in the Bombay Presidency. On 1 May 1960, Maharashtra state was created on a linguistic basis and the Marathi dominant Nanded district became part of Maharashtra. Nanded is associated with some important Sikh gurus. For example, Guru Nanak (1469 – 1539 CE) passed through Nanded on his way to Sri Lanka. Guru Gobind Singh (1666 – 1708 CE) arrived in Nanded with the mughal emperor Bahadur Shah I (1643 – 1712 CE) near the end of August in 1707 CE. When Bahadur moved on to Golconda Singh remained in Nanded. Singh proclaimed he was the last (tenth) living guru and established the sacred text, the Guru Granth Sahib as an eternal "living" leader. Guru Gobind Singh died without a lineal descendant due to the martyrdom of his four sons. In about 1835, Maharaja Ranjit Singh commissioned the construction of a gurdwara at Nanded. It was built on the site of Guru Gobind Singh's cremation. The gurdwara is part of the Hazur Sahib. In 2008, the tercentenary of the passing of the guruship to Guru Granth Sahib, Guru-ta-Gaddi celebrations were held in Nanded. Nanded is the second largest city in Marathawada after Aurangabad. Its area is 63.22 square kilometres (24.41 sq mi). Regarding cities in Maharashtra state, Mumbai, Pune, Nagpur, Nasik, Aurangabad, Solapur and Amravati are larger. Nanded is built on the Deccan Traps lava flows of the upper cretaceous to lower eocene eras. The lava flows are overlain by thin alluvial deposits. The lava flows are horizontal and each flow has two distinct units. The highly weathered vesicular trap and underlying weathered jointed and fractured massive trap constitutes the main water-yielding zones. The soil is mostly formed from igneous rocks and are black, medium black, shallow and calcareous types having different depths and profiles. The city of Nanded is managed by the Nanded-Waghala Municipal Corporation (NWCMC). The corporation consists of 81 democratically elected members. The Municipal Commissioner is the Chief Executive of the Corporation. As of the 2011 census, Nanded had a population of 550,564. The municipality had a gender ratio of 924 females per 1,000 males. 12.4 percent of the population were under six years old. Effective literacy was 87.40 percent. 81.74 percent of women were literate. Male literacy was 92.68 percent. Nanded is a centre for governance and a market town for its surrounding agricultural region. Tourism is supported by 10 million visitors and religious pilgrims. There is also some industrial development. Crops grown around Nanded include cotton, bananas, sugarcane, mangoes, soya beans, sweet limes, and sorghum (jawar). Nanded has a regional cotton research center to support the cotton-growing industry. There is an agricultural school operational under the aegis of Krishi Vidyapeeth of Parbhani. On 17 September 1994, the Swami Ramanand Teerth Marathwada University was established in Nanded after a restructuring of the Marathwada University in Aurangabad. The university supervises the educational activities in senior colleges in four districts of Marathwada division. Nanded is an historical city in the Marathwada region of Maharashtra state. Vedic rituals are performed on the banks of Godavari River These include Urvashi Ghat, Ram Ghat, and Govardhan Ghat. Temples in Trikut village form the Nabhishthan (centre point) of the River Godavari, which is believed to be very sacred for Hindus. Siddheshwar Temple, Hottal – built during the Chalukya era, an example of Hemadpanti temple architecture. Lord Shiva Temple, Tadkhel Village (Degloor Taluka) – built with large stones displaying scripture by the Hindu king, Senapati. Hazur Sahib was built by Maharaja Ranjit Singh. It is one of the Panj Takht, the five seats of higher authority for Sikhs. It is built at the site of cremation of Guru Gobind Singh. His remains and weapons are preserved at the site. Nanded fort is found 4 kilometres (2.5 mi) from Nanded Railway Station. The Godavari river encloses the fort on three sides. There is a garden and water works. Mahur fort – an important point on a major route from the North to the Deccan. The falls, located at Islapur village, are a favourite destination for tourists during the monsoon and are accessible by train. Unkeshwar village in Kinwat taluka has a famous Shiva temple. Hot water springs with containing sulphur and phosphate are believed to have medicinal properties. National highway 61 (Kalyan-Ahmednagar-Parbhani-Nanded-Nirmal), National highway 361 (Nagpur-Wardha-Yavatmal-Nanded-Latur-Solapur-Sangli-Kolhapur-Ratnagiri) and National highway 161 (Akola-Washim-Hingoli-Nanded-Degloor-Sangareddy) pass through the city. The State Road Transport Bus service operates to Nanded. Nanded railway station is located on the Secunderabad – Manmad section of Nanded railway division of the South Central Railway Zone (SCR). Nanded station is the biggest station in Marathwada region. Forty-eight trains arrive each day. Maltekdi Railway Station is another railway station for Nanded. The Shri Guru Gobind Singh Ji Airport is served by daily Trujet Airlines flights to Hyderabad and Mumbai. Recently, Air India started its own operations from the city, connecting Nanded to Amritsar with flights on Saturday and Sunday. Air India also started direct flights to Delhi twice a week beginning 19 November 2018.Also the first direct flight between Chandigarh to Nanded started in January 2019. With this long standing demand of Sikh pilgrims has been fulfilled. Guru Gobind Singh, the last Sikh Guru who died in Nanded. Banda Singh Bahadur, the Sikh military commander. Pachlegaonkar Maharaj, a Rashtra sant, founder of the Mukteshvar Dal, Hindu Rashtra Sena; a social activist and leader of the Hyderabad liberation struggle. Shankarrao Chavan, the former home minister and former chief minister of Maharashtra state. Ashok Chavan, the president of the Maharashtra Congress, a former chief minister of Maharashtra state and an MP of the Nanded Loksabha. Narhar Ambadas Kurundkar, the scholar, critic and author. Kamalkishor Kadam, a former minister of education. Nagnath Lalujirao Kottapalle, an educationalist and author. ^ "Nanded Waghala City Census 2011 data". Indian Census 2011. Retrieved 13 April 2015. ^ "Nanded District - Historical Importance". India.gov.in. Retrieved 17 August 2016. ^ "Nanded". maharashtra government. Retrieved 18 July 2015. ^ a b c Maharashtra State Gazetteers: Nanded. Director of Government Printing, Stationery and Publications, Maharashtra State. 1971. pp. 4, 576. ^ Guruswamy, Mohan. "Police Action". Hyderabad on the Net. Retrieved 31 July 2012. ^ "Gazetteers Department – Bhir". maharashtra.gov.in (Government of Maharashtra). Archived from the original on 24 February 2007. Retrieved 27 February 2007. ^ "New Page 4". beed.nic.in. Archived from the original on 28 September 2007. Retrieved 4 March 2007. ^ Journal of the United Service Institution of India, Volumes 1-2. United Service Institution of India. 1871. p. 58. ^ "The Sikh Review". Sikh Cultural Centre. 20 (218–229): 28. 1972. ^ Tourism National Informatics Centre, India. ^ Siddheshwar Hottal Government of India. ^ "NED/Hazur Sahib Nanded (4 PFs) Railway Station - Today's Train Arrival Timings - India Rail Info - A Busy Junction for Travellers & Rail Enthusiasts". India Rail Info. Ashok Shankarrao Chavan (born (1958-10-28)28 October 1958) is an Indian politician from Indian National Congress party, who has served as the Chief Minister of Maharashtra state from 8 December 2008 to 9 November 2010. He earlier also served as Minister for Cultural Affairs, Industries, Mines and Protocol in the Vilasrao Deshmukh government. On 9 November 2010, the Congress Party asked him to resign from office over corruption allegations relating to Adarsh Housing Society scam. In the 2014 general elections, despite the allegations and anti-incumbency wave, he won the Lok Sabha election from his Nanded constituency with a comfortable margin￼￼￼. He also helped Rajiv Satav to win from the neighbouring Hingoli constituency. In 2015, he was appointed as the president of Maharashtra Pradesh Congress Committee. Chavan belongs to an influential political family, essentially based in Nanded district of Maharashtra state. He has considerable influence over the Marathwada region of Maharashtra. He is the son of Shankarrao Chavan, a former Chief Minister of Maharashtra himself; they are the first father–son duo in the state's history to become chief ministers. His brother-in-law Bhaskarrao Bapurao Khatgaonkar Patil was a three-time Member of Legislative Assembly (MLA) and a three-time MP, and Chavan's wife, Ameeta Ashokrao Chavan is MLA from Bhokar constituency in Nanded. Aurangabad division is one of the six administrative divisions of Maharashtra state in India. It lies in the Marathwada region of Maharashtra. Aurangabad railway station is a railway station located on the Secunderabad-Manmad section which mainly services Aurangabad City. This railway station comes under the Nanded division of the South Central Railway zone and has rail connectivity with major cities such as Hyderabad, Delhi, Nizamabad, Nagpur, Nasik, Pune, Nanded and Latur Road. Hazur Sahib (hazūrī sāhib; lit. "presence of the master"), also known as Takht Sachkhand Sri Hazur Abchalnagar Sahib and Abchal Nagar, is one of the five takhts in Sikhism. It is located on the banks of the River Godavari at the city of Nanded in the state of Maharashtra, India. The gurudwara within the complex is known as Sach-Khand (Realm of Truth).The structure is built at the place where Guru Gobind Singh Ji left his earthly life. The inner room of the gurdwara is called the Angitha Sahib and is built over the place where Guru Gobind Singh was cremated in 1708. The gurdwara was built between 1832 and 1837 by order of Maharaja Ranjit Singh Ji (1780–1839). Kandhar Fort is a fort in Kandhar town in Nanded district of Maharashtra state of India. Encircling the fort, is a moat filled with water. Its construction is attributed to the Rashtrakuta King Krishna III of Malkhed who styled himself as Kandharpuradhi Swar. Mudkhed Junction is railway station serving the town of Mudkhed in Nanded district of Maharashtra. The station is located on Secunderabad-Manmad line and falls under Nanded Railway Division of South Central Railway. A railway line to Adilabad, Wani and Majri Junction on Ballarshah - Sewagram Junction - Nagpur Junction section of New Delhi-Chennai line, branches off in the North-east.The major stations near Mudkhed are Nanded railway station on west and Nizamabad railway station on east. Nanded Lok Sabha constituency is one of the 48 Lok Sabha (parliamentary) constituencies in Maharashtra state in western India. Nanded district is a district of Maharashtra state in central India. The city of Nanded is the district headquarters. National Highway 161, (may be referred to as NH 161), is a National Highway in India running through the states of Maharashtra and Telangana of India. The National Highway 161 joins the cities of Akola, Washim, Hingoli, Nanded, Degloor, Sangareddy and Hyderabad in Central-Southern India with each other. National Highway 361, commonly called NH 361, is a national highway in India that runs entirely within the state of Maharashtra. Its western terminal is in Tuljapur near the intersection of NH 52 and the eastern terminal is in Butibori near Nagpur at the intersection of NH 44. The total length of the highway NH-361 is 548 km. It is a spur road of National Highway 61.The highway passes through the Western Ghats (Sahyadri mountains) and is an important arterial road connecting the Konkan region with Western Maharashtra, Marathwada and Vidharbha regions in the state of Maharashtra. Shri Guru Gobind Singh Ji Airport, Nanded (IATA: NDC, ICAO: VAND) is a public airport located in Nanded, in the state of Maharashtra, India. It was inaugurated on 4 October 2008 by Union Aviation Minister Shri. Praful Patel and the then Chief Minister of Maharashtra, Vilasrao Deshmukh, with Kingfisher Airlines flying a special commemorative flight to Nanded airport using its ATR-72 turboprop aircraft. Swami Ramanand Teerth Marathwada University (SRTMU) was established in 1994. Named after Swami Ramanand Teerth, it is located at Latur Road Nanded in Maharashtra, India. The university is intended to serve primarily the southern part of Marathwada, specifically the districts of Nanded, Latur, Parbhani, and Hingoli. The main university campus, which is about 20 km south of Nanded township, occupies approximately 595 acres (2.41 km2) and there is a 22-acre (89,000 m2) sub-campus at Latur. The university has received recognition from the UGC and the NAAC. Dr. Pandit Vidyasagar is the current vice-chancellor. The registrar, the director of Board of College and University, and the controller of Examination form the three statutory officers of the university. The university has directors for sports and physical education, and students welfare. There is a National Service Scheme (NSS) programme officer. The University has Distance Education Department having PG Programme in Marathi, Hindi, English, Urdu, History, Political Sciences, Sociology, Economics and Public Administration at 59 affiliated Study centers at Nanded, Hingoli, Latur and Parbhani. The university offers 27 postgraduate courses in Arts, Sciences, Commerce, Education, Business Administration, and Pharmacy. The university also offers eight M.Phil. courses..
Tourism in Marathwada refers to tourism in Marathwada region of Maharashtra state of India. Aurangabad city is a regional headquarter of Marathwada and tourism capital of Maharashtra state. Out of 4 UNESCO World Heritage Sites in Maharashtra, 2 of them are in Marathwada. Also there are 110 monuments in Marathwada which are protected by Government of Maharashtra and recognized by Archaeological Survey of India. Marathwada is also important region for Religious tourism, out of 12 Jyotirlingas of Hindu God Shiva, 3 are in Marathwada. 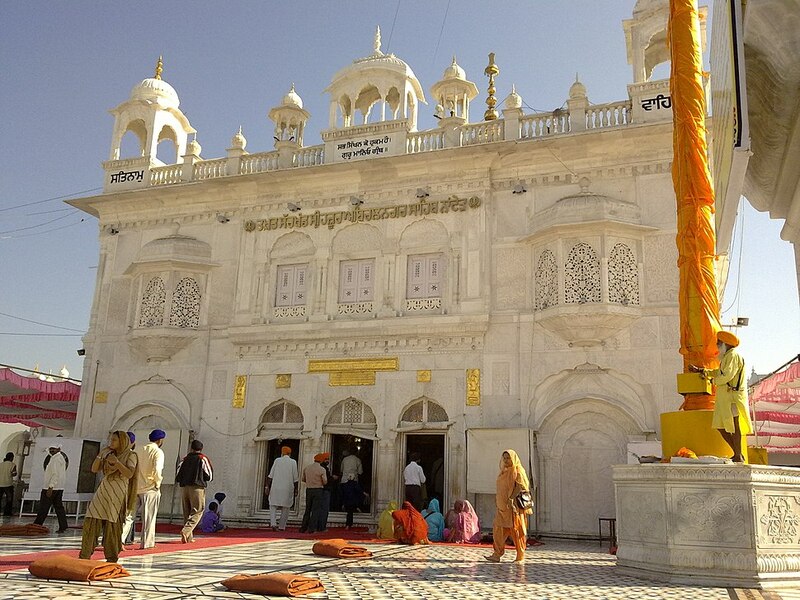 Hazur Sahib Nanded is the second holiest place in Sikhism after Harminder Sahib (Golden Temple) of Amritsir. There are also sufi shrines in Marathwada, most famous among them is Turabul Haq Dargah at Parbhani where thousands of people of all religion visits dargah annually. Pathri in Parbhani district is birthplace of Sai Baba of Shirdi and Sai Baba Birth Temple in Pathri is one of major religious tourism place in Marathwada.